In 2016, Wool-Aid is supporting children in several countries around the world, partnering with a wonderful group of recipient organizations who have staff and volunteers on the ground in each location, working to get our aid to the children who need it most. … children in Nepal who are living in temporary or substandard housing after the devastating earthquake earlier this year. Warm clothing is distributed to children of all ages by a monastery in Kathmandu. … young monks in Nepal and India who have come to their monastery to study and train, often sent by their families as a way to keep them fed. The children range in age from four to sixteen. Appropriate colors for clothing for the young monks are red, maroon, brown, tan, and gold. … children in Ulaanbaatar, Mongolia, through the Dulaan Project. Many of these children live in orphanages; others are homeless and living on the streets. Wool-Aid clothing is sent in a wide range of sizes to support these children and keep them warm. … children within Syria who have been displaced by the conflict in their own country. Wool-Aid is focused on children 9 to 12 years old, sending warm woolen hats, mittens, and vests to keep them warm. Wool-Aid items for other age groups, including clothing and blankets for infants and toddlers, will also be sent for distribution. We are working with Syria Relief, which provides care and support to these vulnerable children in hopes of curbing mass migration to refugee camps outside their own country. … children in Afghanistan who live in orphanages in and around Kabul, or in refugee camps there. Wool-Aid is sending warm woolen clothing and blankets to keep them warm. All of our focus items are needed in Afghanistan, especially for children 5 to 12 years old. We are working with the Lamia Afghan Foundation, which has airlifted millions of tons of relief aid to people in Afghanistan since 2010. As you can see, the process was very carefully supervised by Miss Smokey from above and Mr. Fritz from below. This is about 300 items more than we sent in January of this year, for a total of 2912 items shipped to Ulaanbaatar in 2015! 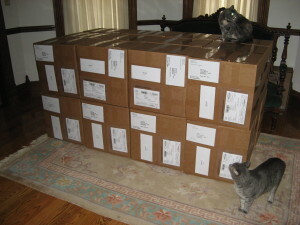 The current shipment is in transit and should arrive in Ulaanbaatar soon so that it can be distributed to the children. Current temperatures are already registering below zero there. FIRE (Flagstaff International Relief Effort) included Wool-Aid’s contributions from earlier this year in their end-of-year newsletter for 2015: Received and distributed 1,307 donated hand knitted winter items to orphanages and the disabled. This is what you have done for the children of Ulaanbaatar this year! Thank you! 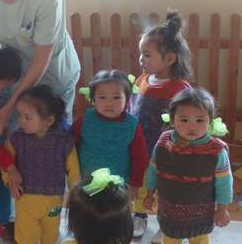 Wool-Aid is pleased to continue its support of children in Ulaanbaatar, Mongolia through the Dulaan Project. We coordinate with FIRE (Flagstaff International Relief Effort), whose staff in Ulaanbaatar organizes the distribution. Winters in Mongolia are brutal, with temperatures that rarely get above freezing and that can often dip to -40 degrees at night. The capital city, Ulaanbaatar, is the coldest capital in the world. Wool-Aid sends hats, mittens, socks, sweaters, vests, and blankets to the children to help keep them warm in these extreme conditions.